Prime focus photography is popular for short exposure images of terrestrial objects as well as celestial objects like the Moon. You can take pictures of terrestrial and/or celestial scenes by using a simple T-ring and T adapter to turn your telescope or spotting scope into a large telephoto lens. 1. This adapter is specially designed for telescope prime focus astrophotography. 2. Threads: T 2 threads (M42 x 0.75): Compatible with standard T -ring from almost all brands in the market . 3. Standard 2" tube , compatible with telescopes uses 2" focuser and accessories. 4. Metal frame work for long time use. 5. Anti-reflection painting process to reduce internal reflections. 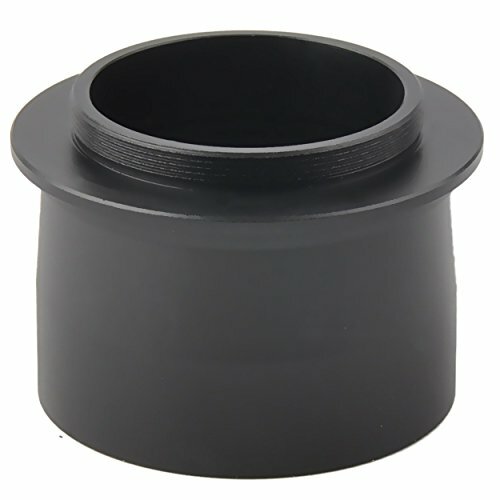 Standard 2" barrel size to insert to 2" telescope focuser or other accessories. Threaded for Standard 2" Eyepiece Filters . T 2 threads (M42x0.75) at one side. Needs a T ring for a Certain DSLR camera to attach to the camera body. All metal construction. Baffles is machine-threaded and anti-reflection painting process to reduce internal reflections. The light path is extended by only 3mm, which is good news for the focus position as it is hardly changed. View More In Photo Adapters. If you have any questions about this product by Gosky, contact us by completing and submitting the form below. If you are looking for a specif part number, please include it with your message.